Following their recent meeting in the Division 2 final, Meath manager Andy McEntee questioned the star forward's apparent influence on Tipperary referee Derek O’Mahoney, who took charge of the Croke Park decider. 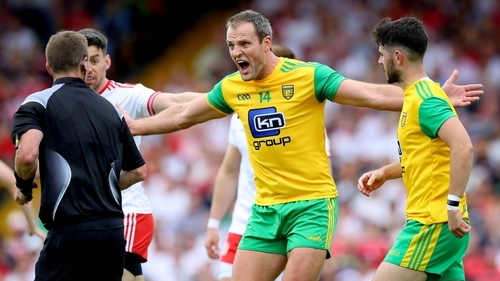 Murphy's impressive haul of seven points inspired Donegal to victory from a 1-06 to 0-01 deficit, but McEntee appeared to suggest that Murphy was perhaps fortunate not to get sent off in that tie. "He’s just very influential all around the field," the Irish News quoted him as saying after the final. "The fouls Michael gets booked [for] and ticked on maybe three or four occasions? That possible? Maybe I’m exaggerating but I doubt it." Murphy, however, has dismissed that theory and insists that his only aim on the pitch is to play football. "What do you say to it?" he said at the launch of the 2019 Kellogg’s Cul Camps. "It wouldn't be a bad thing to have even though it's rubbish. There's sometimes and some instances where you commit a foul and you get a yellow card but I'm in no place to influence anything. I go out and play the game as best I can as an individual." Murphy added that he can only block out these claims whenever they emerge, although he says he has never heard his name associated with that kind of behaviour on the field. "Aye, what else can you do as a player? Your job is to go out and play on the football field. My job will be to get as fit as possible for the coming championship game against Fermanagh in seven weeks. That's all that will be in my head and the rest of the team. Murphy at the launch of the 2019 Kellogg's Cul Camps in Croke Park. "It’s the first time I’ve ever been asked about it in an interview or anything like that. It’s a difficult one to answer. It’s the first time it’s come up." Murphy made a late return to the Donegal panel during the league campaign after undergoing surgery in January for a knee injury. With the Ulster championship looming, he was thrilled to get some competitive game time in the legs. "The speed of the National League now is gone through the roof. It's right up on par with what a championship game would be. It takes a little while longer, I'd hoped to be back a wee bit earlier in the league but the operation and recuperating from that took a wee while longer than normal. "Touch wood everything's good at the moment and I'll push forward now towards championship." Donegal collected their Division 2 silverware having already secured promotion to the top tier for next season. They will now prepare to turn their attention to an Ulster championship game against Fermanagh on 26 May with a place in the semi-finals up for grabs. Key forward Paddy McBrearty recently made a return to club action after recovering from the cruciate ligament injury he sustained last year, and looks to be on course to rejoin the Donegal panel ahead of that crunch game in Brewster Park. Inter-county players are currently observing the club-only month, and Murphy was thrilled to see McBrearty back on the pitch at the weekend. "We played Patrick's club Kilcar on Sunday so it was brilliant for us all to see Patrick back. "Obviously he suffered the dreaded cruciate and it's not a nice injury. He was at the peak of his powers last summer and was playing some really good stuff for us. We were disappointed to lose him coming into a crucial time of year but he's worked really hard to come back. "For us all to see him out on the pitch for the last month or two gave us all a lift. "Knowing Patrick and being a team-mate of his for the last number of years, I know he'll be mad hungry to get back out on the field and get the jersey back on and hit the form he had last year." Declan Hannon, Sarah Dervan, Sean Wade, Sinead Ahearn, and Michael Murphy launched the 2019 Kellogg's Cul Camps campaign at Croke Park today. Open for registration now on www.kelloggsculcamps.gaa.ie Kellogg's Cul Camps is Ireland's biggest children's summer camp.